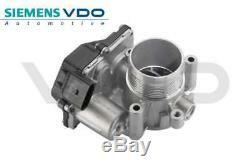 VW GOLF PASSAT SHARAN TIGUAN 2.0TDI Throttle Body VDO OEM 03L 128 063 R. Independent BMW Parts Specialist Since 1983. Sign up for our Newsletter to receive Special Offers! Engine and year changes can mean there is more than one type for your car and by checking with us if you are unsure will help us supply you the correct part for your vehicle. Should this be the case, you will incur return costs. Please be aware that we cannot accept liability for any expenses incurred because of delayed or unsuccessful deliveries. A2C59514304, VDO Control Flap, air supply. EAN 4103590951236 Ø 48 mm Operating Mode Electronic Info with seal. Check new part against old part. Components at risk due to electrostatic discharge. DO NOT TOUCH PLUG CONTACTS. 03L 128 063 G 03L 128 063 K 03L 128 063 R 03L 128 063 AC. VW BEETLE (5C1, 5C2) 2.0 TDI 04.11 - 103 140 1968 Hatchback Engine Code: CFFB VW BEETLE Convertible (5C7, 5C8) 2.0 TDI 04.12 - 103 140 1968 Convertible Engine Code: CFFB VW CADDY III Estate (2KB, 2KJ, 2CB, 2CJ) 2.0 TDI 4motion 08.10 - 05.15 81 110 1968 Estate Engine Code: CFHF Chassis no. From: 2K-B-200 001 VW CADDY III Estate (2KB, 2KJ, 2CB, 2CJ) 2.0 TDI 16V 11.10 - 05.15 103 140 1968 Estate Engine Code: CFHC Chassis no. From: 2K-B-200 001 VW CADDY III Box (2KA, 2KH, 2CA, 2CH) 2.0 TDI 4motion 08.10 - 05.15 81 110 1968 Box Engine Code: CFHF Chassis no. From: 2K-B-200 001 VW CADDY III Box (2KA, 2KH, 2CA, 2CH) 2.0 TDI 16V 11.10 - 05.15 103 140 1968 Box Engine Code: CFHC Chassis no. From: 2K-B-200 001 VW GOLF VI (5K1) 2.0 TDI 10.08 - 11.12 100 136 1968 Hatchback Engine Code: CFFA Chassis no. From: 1K-9-400 001 VW GOLF VI (5K1) 2.0 TDI 10.08 - 05.13 103 140 1968 Hatchback Engine Code: CFFB Chassis no. From: 1K-9-400 001 VW GOLF VI (5K1) 2.0 TDI 4motion 05.09 - 11.12 103 140 1968 Hatchback Engine Code: CFFB Chassis no. From: 1K-9-400 001 VW GOLF VI (5K1) 2.0 TDI 04.09 - 11.12 125 170 1968 Hatchback Engine Code: CFGB Chassis no. From: 1K-9-400 001 VW GOLF VI Estate (AJ5) 2.0 TDI 01.10 - 07.13 81 110 1968 Estate Engine Code: CLCA VW GOLF VI Estate (AJ5) 2.0 TDI 07.09 - 07.13 100 136 1968 Estate Engine Code: CFHB VW GOLF VI Estate (AJ5) 2.0 TDI 07.09 - 07.13 103 140 1968 Estate Engine Code: CFHC VW JETTA IV (162, 163) 2.0 TDI 10.10 - 81 110 1968 Saloon Engine Code: CLCA VW JETTA IV (162, 163) 2.0 TDI 02.11 - 103 140 1968 Saloon Engine Code: CFFB Engine Code: CFHC Engine Code: CLCB VW PASSAT (362) 2.0 TDI 08.10 - 12.14 103 140 1968 Saloon Engine Code: CFFB VW PASSAT (362) 2.0 TDI 4motion 08.10 - 12.14 103 140 1968 Saloon Engine Code: CFFB VW PASSAT (362) 2.0 TDI 08.10 - 12.14 125 170 1968 Saloon Engine Code: CFGB Engine Code: CLLA VW PASSAT (362) 2.0 TDI 4motion 08.10 - 01.13 125 170 1968 Saloon Engine Code: CLLA Engine Code: CFGB VW PASSAT Estate (365) 2.0 TDI 08.10 - 12.14 103 140 1968 Estate Engine Code: CFFB Chassis no. From: 3C-B-200 001 VW PASSAT Estate (365) 2.0 TDI 4motion 08.10 - 12.14 103 140 1968 Estate Engine Code: CFFB Chassis no. From: 3C-B-200 001 VW PASSAT Estate (365) 2.0 TDI 08.10 - 12.14 125 170 1968 Estate Engine Code: CFGB Engine Code: CLLA Chassis no. From: 3C-B-200 001 VW PASSAT Estate (365) 2.0 TDI 4motion 08.10 - 01.13 125 170 1968 Estate Engine Code: CLLA Engine Code: CFGB Chassis no. From: 3C-B-200 001 VW POLO (6R, 6C) 1.2 TDI 10.09 - 55 75 1199 Hatchback Engine Code: CFWA Chassis no. From: 60-AT000 001 "IND" Chassis no. From: 6R-A-000 001 VW SHARAN (7N1, 7N2) 2.0 TDI 05.10 - 100 136 1968 MPV Engine Code: CFFA VW SHARAN (7N1, 7N2) 2.0 TDI 05.10 - 103 140 1968 MPV Engine Code: CFFB VW SHARAN (7N1, 7N2) 2.0 TDI 08.10 - 125 170 1968 MPV Engine Code: CFGB VW TIGUAN (5N_) 2.0 TDI 05.10 - 81 110 1968 Closed Off-Road Engine Code: CFFD. Enter a daytime contact telephone number. Enter the telephone number for the confirmed address. The cost of returning the item will be at the buyers expense unless previously agreed with Motormec. Certain items may be sealed within a clear plastic bag inside the original packaging. Does this part fit my vehicle? How much to send my order overseas? How long will it take to receive my item? Other items in our store.. The item "VW GOLF PASSAT SHARAN TIGUAN 2.0TDI Throttle Body VDO OEM 03L 128 063 R" is in sale since Wednesday, October 10, 2018. This item is in the category "Vehicle Parts & Accessories\Car Parts\Air Intake & Fuel Delivery\Throttle Bodies". The seller is "bmwmotormec" and is located in Swindon. This item can be shipped to United Kingdom, Austria, Belgium, Bulgaria, Croatia, Cyprus, Czech republic, Denmark, Estonia, Finland, France, Germany, Greece, Hungary, Ireland, Italy, Latvia, Lithuania, Luxembourg, Malta, Netherlands, Poland, Portugal, Romania, Slovakia, Slovenia, Sweden, Australia, United States, Canada, Brazil, Japan, New Zealand, Israel, Hong Kong, Norway, Indonesia, Malaysia, Mexico, Singapore, South Korea, Switzerland, Taiwan, Thailand, Chile.